There's no better setting to experience Tennessee than this exceptional 2-bedroom, 1-bathroom Reliance vacation rental cabin with room to comfortably accommodate 6 guests. Surrounded by unbelievable views and just steps from the breathtaking Hiwassee River, this cabin offers everything you for a relaxing retreat! 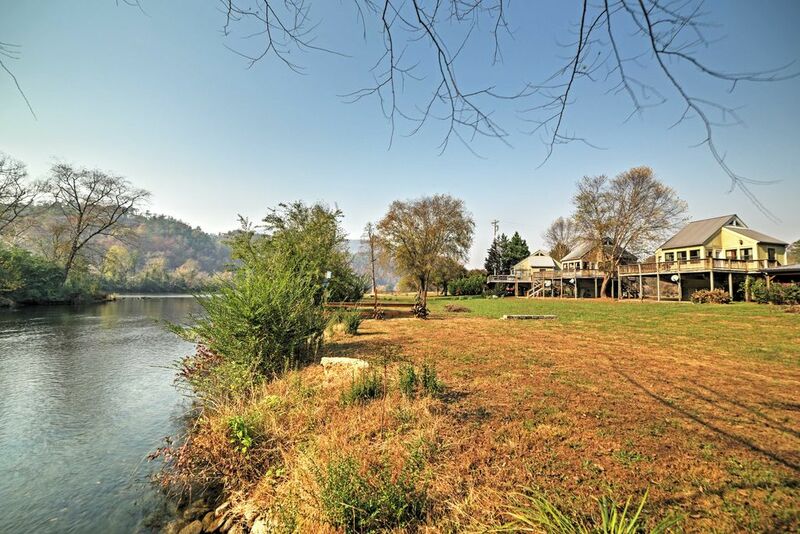 Have the ideal Tennessee getaway while tubing, paddle boarding, swimming, fishing and rafting on the river while staying at this incredible Reliance cabin! Look forward to spending downtime on the deck, sharing a glass of wine on mild evenings with your loved ones, or relaxing and reading a good book. The large windows on the deck allow for an abundance of natural light to flow throughout the living space and make feel as if you're always outdoors. Inside, 575 square feet of delightfully appointed living space awaits to provide you with everything you'll need for a tremendous vacation! This cabin's comfortable interior is ideal for a small family or group who looking to escape the hustle-and-bustle of everyday city life. Once you've worked up an appetite, return home to construct a culinary masterpiece in the kitchen, equipped with every necessary tool and appliance needed to impress your companions. Just a few steps from the cabin, you'll be able to participate in a plethora of fun water activities in Hiwassee River, including tubing, paddle boarding, rafting, fishing, and swimming. If you feel like venturing further, travel 2 hours to explore Tennessee's natural beauty on one of the many stunning hiking trails at Nantahala National Forest. For a mouthwatering meal, visit flip-flop burgers or grab some tasty ingredients at Hall's Grocery. - Prime location! Nestled on the magnificent Hiwassee River, you won't have to travel far for swimming, tubing, world class fly fishing and paddle boarding! The house is simple, basic 2br, 1 bath. We loved the deck; however, the pictures show a seemingly brand new deck, and that is not the case. It definitely needs some handiwork, sanding, and paint. Both of my kids got splinters in their hands and feet from the deck, and they were not running. Our kids wanted to fish from the bank (there is no deck on the river), and we had to traipse through about 2 feet of grass in the yard to get to the river. Luckily for us, we didn't come across any snakes. For the amount of money we spent to stay 3 nights, it would have been nice to have the yard mowed. Amenities include "wireless internet, tv, and much more" - for a more truthful statement, it should note that wireless internet is very spotty, and while the cabin has satellite set up outside for tv, it does not work. So if you require internet or would like to watch some tv in the evenings, bring some DVDs and just know you won't be able to connect with anyone really via internet or phone. The river view is beautiful, the neighbors around us were very friendly, and the outdoor scenery and activities were awesome! I just wished the homeowners cared about the property and their renters.